The following images and videos speak for themselves, so the only comment we'll make is that we discourage looking at any of them while eating. The NY Times has published an article investigating the estimates of the amount of spill released by BP and the government. 5,000 barrels a day may be a grand understatement. Please also see this post for ways we can help. Oil gushing from the 12" riser pipe almost 5,000 ft below sea level. Image from BP via Treehugger. An aerial view still taken from a video (watch below) by John Wathen at LiveLeak.com. 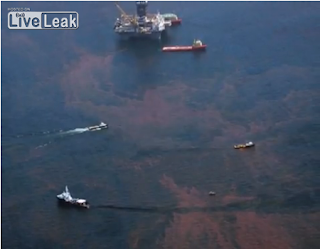 The most recent video footage of the spill to be released by BP. Via Treehugger.